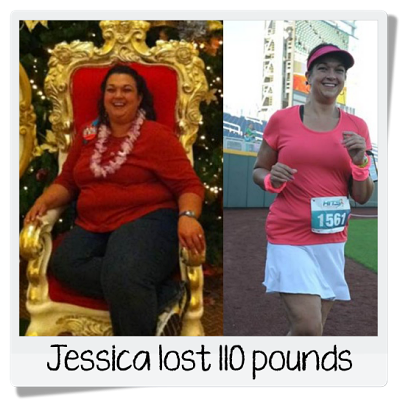 Runs for Cookies: We Lost 100+ Pounds! I have a VERY special Motivational Monday to share today! 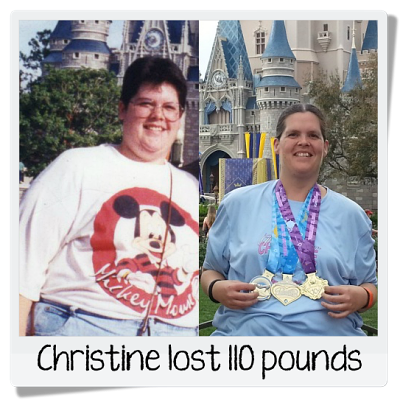 Since this is the 100th Motivational Monday post, I thought it would be so fun to share photos and tips from several people who have lost 100+ pounds. I'm in the 100+ club myself, but even I learned some great info from reading what these inspiring people had to say! While I wish I could share each of their entire stories, that would be extremely lengthy; so I decided on a Q&A type format. I gave each of them a list of questions, and let them answer as many or as few as they wanted, and I'm posting the most valuable and unique answers here. Be prepared for some serious inspiration!! How did you lose the weight? I tracked calories with the Lose It! app and started a couch to 5K app in March 2014, which sparked my love for running. What was the hardest part of losing the weight, and how did you overcome that? The first few months were the hardest because I was cutting calories and getting more exercise but wasn't seeing results right away. I wanted instant gratification! I read motivating weight loss posts that reminded me that I would see results eventually and that I had to be patient. What was the most surprising/helpful thing you learned about yourself while losing weight? Running is fun and therapeutic! I used to hate it, but now I crave running and enjoy the time to myself to just think and focus on everything in my life. What is your best suggestion for keeping the weight off and not returning to old habits? Make it a lifestyle change! Find healthy foods you love so it doesn't feel like a diet that burdens you. Find an activity you love to do so you don't dread/avoid exercise. What is your best advice for others who are trying to lose weight? Don’t let one bad day discourage you; if you mess up, pick yourself up, try to stop beating yourself up over it, and move on. Baby steps--it all happens little by little, not overnight. What is your best suggestion for keeping the weight off and not returning to old habits? Everyone is different, but for me (still being new to this), I weigh myself every morning. I try to stay in a five-pound range, and if I see that number going slightly up for a few days then I know I need to change something up. I also find honestly writing down what I eat (yes, even that cheat snack) helps me stay on track. How did you lose the weight? 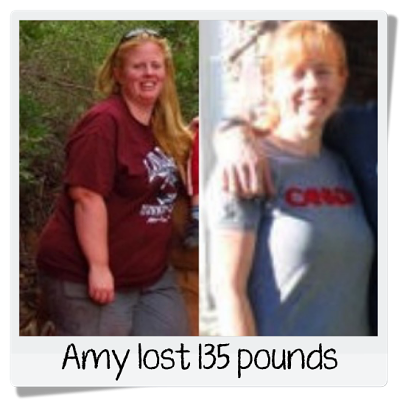 I used Medifast to take off the majority of the weight, and did the last ten pounds or so on Weight Watchers. After I lost most of the weight, I started a 5k training program, and now I run/work out regularly and follow Weight Watchers to maintain my weight. How do you keep going when you are lacking motivation and feel yourself falling back into old habits? I try to remind myself of how much better I feel now, and how much I am able to do that I couldn't at my heaviest. I couldn't even get through the first day of C25K before, and I recently completed my first half marathon. What is your best advice for others who are trying to lose weight? Keep trying, and don't give up. I tried to lose weight dozens of times (and with multiple different programs) and never lost more than 40 pounds, which I always gained back. Even if you stop and start 100 times, just keep going. What is your best suggestion for keeping the weight off and not returning to old habits? Tracking everything I eat (and weighing and measuring) is extremely helpful. I also have a plan for what I'm going to eat every day and when I'm going to exercise - putting it down on paper helps me stay on track and not fall back into bad habits. How did you lose the weight? I lost my weight using Weight Watchers. At first, I didn't exercise; but then I added short workout videos at home, and then gradually started working out in the gym. How do you keep going when you are lacking motivation and feel yourself falling back into old habits? I got into running. I am still really slow and I use a combination of running and walking, but having a race on my schedule with a goal to look forward to keeps me motivated. What is your best advice for others who are trying to lose weight? Don't try to make huge changes all at once. Start with small steps. Even if you are going to watch your diet every other day, it is a start; and then you won't feel like you are deprived. You can gradually work up to a healthy meal plan daily, with some planned indulgences. What do you wish your “heavier self” had known? That losing weight and getting active was possible. I was overweight for the first 31 years of my life. I just never thought anything else was possible. It is never too late to start. I am 44, still working on losing weight and I am training for my first full marathon! Anything is possible! How did you lose the weight? More than anything, it was a mental change of making up my mind to be consistent and to not give up. Physically, I started by cutting out things that I knew were bad for me that I felt like I could live without (for me, soda was the first thing), and limiting my calorie intake according to a formula I found online and later MyFitnessPal. I then began working out regularly (1-2 days a week at first, then 3, now I’m up to 5). What was the hardest part of losing the weight, and how did you overcome that? Overcoming my lifelong conditioning of eating poorly was the hardest part, by far. During childhood, I had formed horrible habits and was 450+lbs by the time I left high school. Overcoming it was a process of altering habits gradually; changing the kinds of foods I ate over time so it didn’t feel like I was having to get rid of all food that I enjoyed (read: was addicted to) all at once, and lowering my food intake in stages rather than trying to go ‘cold turkey’ as I had tried in the past. How do you keep going when you are lacking motivation and feel yourself falling back into old habits? My wife helps me a lot. We’ve been very fortunate in having each other for support. If I feel like I’m slipping she’ll generally be on point and vice-versa. In a ‘long term’ sense, I also focus a lot on trying to lengthen my life as to spend as much time with her as possible, which is a big motivator. Also--old pictures. Nothing makes you remember what life was like 300 pounds ago, and how you never want to go back, like old pictures. What is your best advice for others who are trying to lose weight? Slipping ‘off the bandwagon’ isn’t a reason to give up. Don’t expect yourself to be perfect. You won’t be. Instead of looking at one night of bad eating (or whatever you did) as ‘failure’ look at it as a bump in the road on a long journey. Don’t use it as an excuse to break down and stop, use it as a reason to work harder tomorrow. What is your best suggestion for keeping the weight off and not returning to old habits? Don’t approach weight loss as if it’s a short term project that you can complete in a year or two and then you can ‘go back to normal’. Instead you have to create a new normal for yourself. If you want to keep weight off you need to come to a mental understanding that living healthy isn’t something you’ll be able to stop doing if you want to keep it off. It’s not a situation where you lose 50 pounds, or 100 pounds, or whatever your desired number is, and you can just go back to how things were that made you unhealthy in the first place. How did you lose the weight? I don't restrict any food groups (but some foods I choose not to have around much because of binge potential). I track food on MyFitnessPal, and found that I rather enjoy running--for how it makes me feel, and the additional calories that help me be satisfied and not "cheated". What was the hardest part of losing the weight, and how did you overcome that? The hardest part for me is the constant mindfulness that is required; sometimes I feel like it takes up too much of the space in my brain. I still struggle with that. Also, I struggle with the "all or nothing" mindset... sometimes in ridiculous ways. For example, rather than buckle down on the calories on days I don't earn extras from exercising, it is a battle to not just say, "Well, I already didn't exercise, may as well eat a second burger", or whatever is tempting that day. I know what I need to do and how to do it, but I wish I didn't STILL have this internal struggle from time to time. What was the most surprising/helpful thing you learned about yourself while losing weight? I can talk myself into or out of just about anything. Sometimes I just forget that. What is your best advice for others who are trying to lose weight? You deserve to be healthy, comfortable in your own skin, and able to enjoy life feeling good. Making healthy, reasonable, and responsible food choices while allowing yourself things you enjoy, and staying physically active can make this a reality. What do you wish your “heavier self” had known? 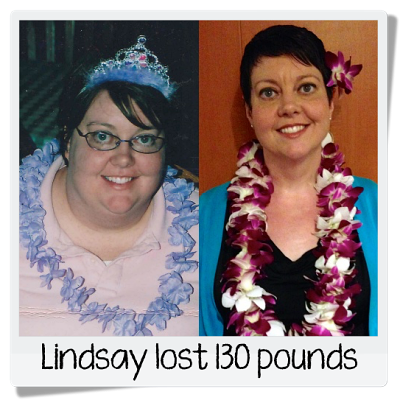 After failed weight loss attempt after failed weight loss attempt, I had myself convinced that (as ridiculous as it sounds) 300+ pounds was my body's "natural" weight--it was where my body wanted to be. Now, I look at those pictures and feel really disconnected from that. It was, of course, an excuse to not make the changes that my body really craved. Now, though I am still on the large side, I look at those pictures and can't imagine that I could ever think that I was destined to be like that. I wish my heavier self had known that it was okay to expect that life could be better and that I COULD do something about it; it just takes patience, self-forgiveness, and stubbornness. How did you lose the weight? I used SparkPeople.com, tracked my calories, and exercised 4-5 times per week. What was the hardest part of losing the weight, and how did you overcome that? The hardest part for me was changing my eating habits. Eating smaller portions, eating different foods, and tracking everything. I made small goals and made meal plans before grocery shopping. If I didn’t have it in the house, I didn’t eat it! What was the most surprising/helpful thing you learned about yourself while losing weight? Before I lost weight, I assumed I was just a big boned person. However, as I was losing I kept having to buy smaller and smaller clothes. At my goal weight of 140 pounds, I was a size 2! I couldn’t believe it! I was at the top of the healthy BMI range and was a size 2. What is your best advice for others who are trying to lose weight? Make small goals. 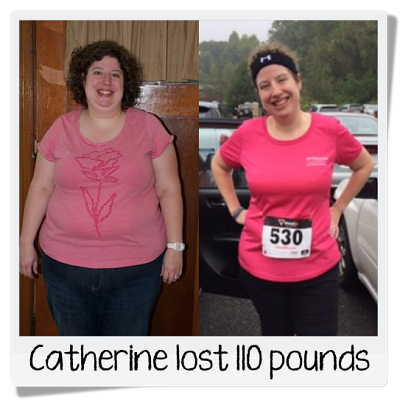 I initially made a goal to lose 10 pounds. I hit that goal, so I kept making small goals until I reached my ultimate goal weight. I also recommend tracking everything that you eat. Even if you are having a bad day! How did you lose the weight? I hired a personal trainer to teach me how to exercise and eat properly. Then I found a passion for learning about nutrition, and I continued on my own by eating right and exercising (including running, of course)! What was the most surprising/helpful thing you learned about yourself while losing weight? I learned that I love to cook! Because I began losing weight as a teenager, I’d never really cooked for myself before. I had to take the opportunity to learn new recipes and different ways to incorporate new healthy foods; turned out I really enjoyed it! What is your best advice for others who are trying to lose weight? Your mind is powerful. If you believe you’re going to fail, your actions will follow your thoughts. Visualizing myself at my goal weight was a trick I used that really worked and got me through many workouts. What is your best suggestion for keeping the weight off and not returning to old habits? Don’t expect to be perfect—you’re going to gain weight once in a while. 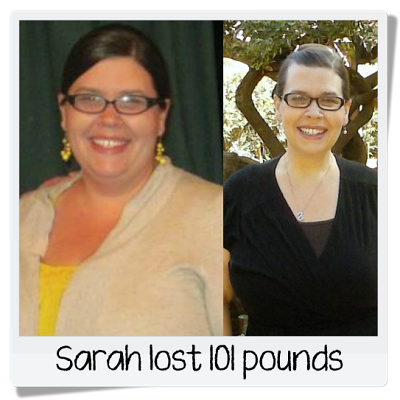 People who have always been a healthy weight fluctuate too! Don’t throw an entire day, week, or month away because you overindulged for one meal. How did you lose the weight? I always answer this question by saying "just how the doctors tell you to do it... be careful about what you eat and MOVE!" I started out walking and then, slowly, running; all while watching what I ate. I never followed a specific plan or cut anything completely from my diet. What was the most surprising/helpful thing you learned about yourself while losing weight? Probably the most surprising thing that I learned about myself is that I'm a runner... and I just ran my first half marathon! If someone had told me three years ago, after the birth of my fourth child, that I would run a half-marathon three years later, I would have laughed in their face. I learned that I am capable of more than I could have ever imagined! How do you keep going when you are lacking motivation and feel yourself falling back into old habits? I think about my husband and four little ones. My momma just passed away in July, at 57 years old, after a long struggle with diabetes, kidney failure, and many other complications. I saw what a struggle the last 10 years of her life was like... I know what if felt like to watch her go through it. I know what it feels like to no longer have her here to see, to talk with, to get advice from. I don't want my kids or husband to go through the same. That is motivation enough. What is your best advice for others who are trying to lose weight? Keep at it. Try again. YOU CAN DO IT! I tried for years before something finally clicked. Start simple. 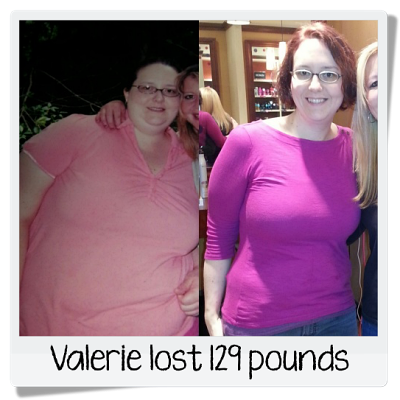 I didn't start out attempting to lose weight... so my focus wasn't on the scale. I just started walking several times a week, and after a month or two, I realized that I had lost weight. Worry less about the number on the scale and more about trying to make small changes to improve your health. How did you lose the weight? I joined Weight Watchers in July 2012 the day after my birthday. I tracked points (not simply filling) and got to goal in a year, with running in the mix too. What is your best advice for others who are trying to lose weight? If you aren't willing to do it every day for the rest of your life (whether it is a type of exercise or a food you're eating/not eating or an amount you're eating or a medication you're taking), don't rely on it as a strategy to lose weight or you'll just regain it when you stop doing that thing. Also, give yourself credit for the things you're doing well. On days the scale isn't moving, you're still eating healthier and moving more and that has benefits beyond the scale. What do you wish your “heavier self” had known? I wish she'd known that she wasn't unhappy because she was overweight - she was just unhappy and needed to work on believing in herself. Running has done far more for my sense of self than losing weight ever did, so I would definitely like to go back and give my 250 pound self who started running a super high five!! How did you lose the weight? I started working out at least 3 days a week and using My Fitness Pal. I started on a recumbent bike, then elliptical, and now I'm running. What was the hardest part of losing the weight, and how did you overcome that? I actually had two giant obstacles in my way at first. One was the complete dislike of most fruits and vegetables; and the second was being a sedentary, heavy smoker since the age of about 13. I quit (officially) smoking when I started running (about 18 months ago) and through a lot of trial and error, have taken baby-steps to eating (and liking!) lots of fruits and veggies. Slowly introducing new foods and exercise was definitely the key. What is your best advice for others who are trying to lose weight? Read Katie’s blog! Her mantra of not changing anything that you can’t stick with forever was a very eye-opening thorough process for me. 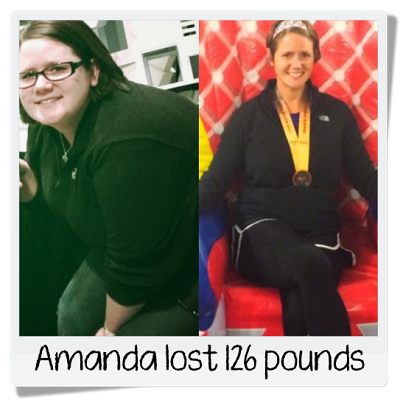 I contribute so much of my success to her story and ideologies about the mental and physical struggle of losing (and maintaining) 100+ pounds lost. What is your best suggestion for keeping the weight off and not returning to old habits? I keep a control center on my fridge, complete with pictures of what we used to look like and how we have changed over the years. We keep a spreadsheet there as well and weigh in every Wednesday and keep a workout schedule that we fill out each month. It’s a constant reminder to stay the course. How did you lose the weight? 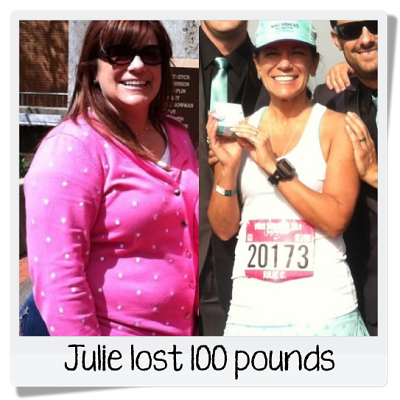 I lost the weight by running and following Weight Watchers. What was the hardest part of losing the weight, and how did you overcome that? It was all equally hard. Staying motivated has always been an issue for me. 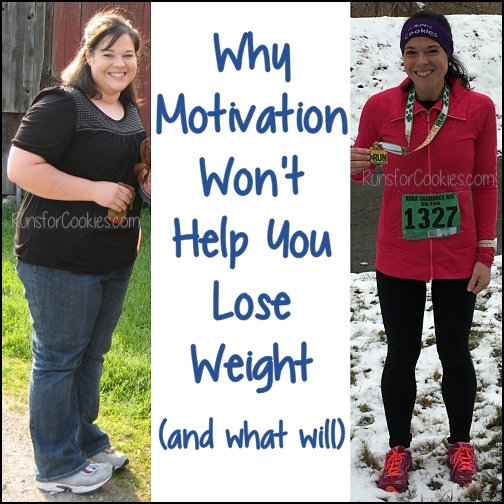 I stayed motivated by finding blogs to follow on the Weight Watchers site, and elsewhere on the internet, of people who lost weight by running and/or following Weight Watchers. What was the most surprising/helpful thing you learned about yourself while losing weight? I am goal-oriented. I need to have a goal, like a race, to keep me motivated, otherwise I get lazy. How do you keep going when you are lacking motivation and feel yourself falling back into old habits? I still go to Weight Watcher's meetings every Saturday. That really helps me. What is your best advice for others who are trying to lose weight? Give yourself time. Think about how you want to look a year from now, and think about what you are doing NOW to make that happen. What do you wish your “heavier self” had known? I wish I had known how happy I would be at a normal size. I wish I had known that running, and other forms of exercise, really are the best therapy. I wish I had known that endorphins make you feel great! I wish I had known that the changes in your body that consistent exercise makes is like magic! How did you lose the weight? I signed up with MyFitnessPal and started counting calories. I dabble with paleo and clean eating, but I mostly just eat what I want within my calories. Counting calories opened my eyes to the nutritional value of a lot of junk foods and I stopped eating a lot of those things! I started exercising and running within this past year and that has helped shed the weight a lot faster coupled with my healthy diet. 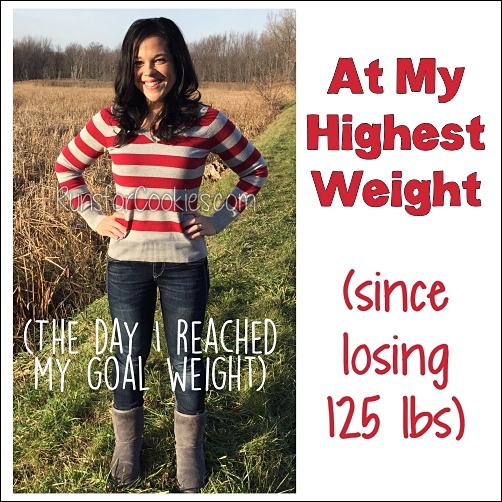 What was the hardest part of losing the weight, and how did you overcome that? The hardest part was thinking about how much work I was putting in with eating correctly and exercising so much and still having so much weight to lose. When you're in the middle of losing an amount of weight like 100lbs it can mess with your mind. When you feel awesome that you've already worked so hard to lose a number like 50lbs and then realize you have another 50 or more to go, it can defeat you if you let it. What was the most surprising/helpful thing you learned about yourself while losing weight? Everything!! I've never been a fan of exercising, and I especially hated running pretty much my whole life. 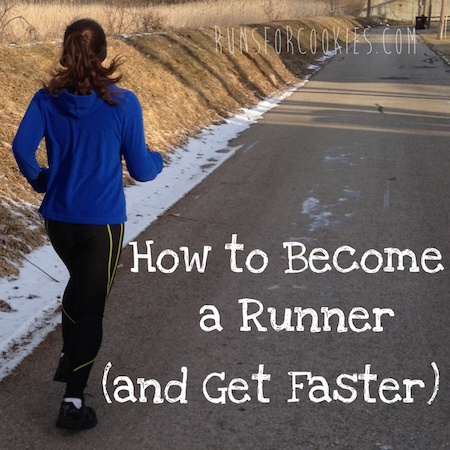 Who knew I could be a success story and willingly train for a half marathon? I didn't know I could be this person, and I really like her! How do you keep going when you are lacking motivation and feel yourself falling back into old habits? This happens to me a lot, and I'm so fortunate that I really love running because when my eating slips up those miles are the only things that help me keep going! It's hard, but you just have to take it one day at a time, throw the junk out, fight those cravings with tears and tantrums and get back into it again. What is your best suggestion for keeping the weight off and not returning to old habits? 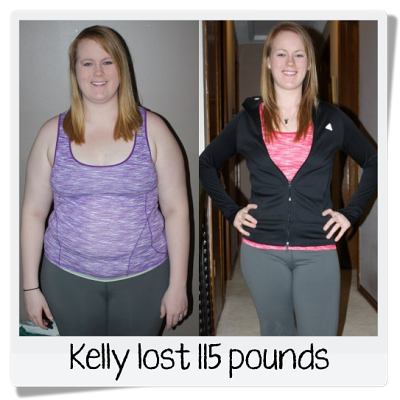 Look at before pictures!! Remember the who and the why that you're doing this for, remember how you felt then and how good you feel now. And running helps too! How did you lose the weight? Weight Watchers - full lifestyle change and hard exercise program. What was the hardest part of losing the weight, and how did you overcome that? Feeing like I couldn't eat what I want when I wanted. I overcame it by still allowing treats, but planning for them instead. What is your best advice for others who are trying to lose weight? If you are tired of starting over again and again, then don't quit. What do you wish your “heavier self” had known? How awesome life is when you are a normal healthy weight! The things you can do and places you can go are SO much bigger. Losing the weight was the best thing I could have ever done for myself. Now I get to be a great role model of a healthy lifestyle for my daughter so she will not have to go through what I went through. What an amazing gift to give her!!! Pounds Lost: 130 pounds initially, and five years later I am maintaining 110 pounds lost. How did you lose the weight? 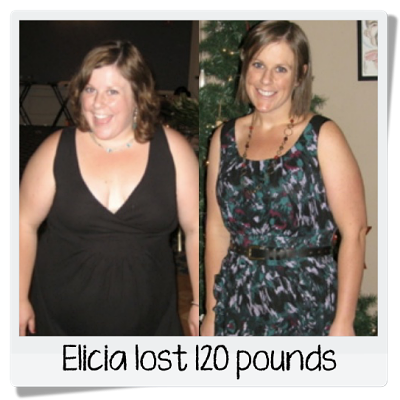 Weight Watchers helped me to lose the weight and continues to help me to maintain the weight lost. 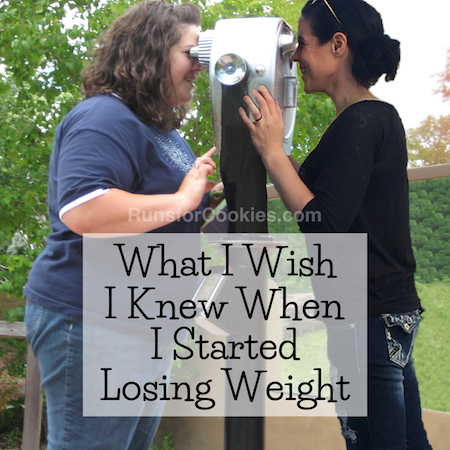 What was the hardest part of losing the weight, and how did you overcome that? The hardest part was making the change in the beginning. I was living the single life and eating out all the time. It was a huge adjustment, so I made the Weight Watcher plan fit MY life. What is your best suggestion for keeping the weight off and not returning to old habits? Stay connected to a support system. Meetings, on-line message boards, walking buddies, family and friends, whomever it is... stay connected. When somebody stops communicating that means they need some extra support. What do you wish your “heavier self” had known? I wish my heavier self knew that she was beautiful. I always knew I was an awesome person on the inside, and after losing my weight, I feel the outside now matches the inside. Regardless of the packaging on the outside, I was, and will always be, a beautiful person. What was the hardest part of losing the weight, and how did you overcome that? Winter; I hate running on the treadmill, I feel like a hamster :-). I started playing lots of indoor sand volleyball instead (something I really enjoy). What is your best advice for others who are trying to lose weight? Find ways to work out that you really enjoy so that it's something you look forward to rather than having it as a chore. Find healthy things to eat that you don't have to gag down. What is your best suggestion for keeping the weight off and not returning to old habits? Same as above; you need to find ways to eat and exercise that are sustainable. How did you lose the weight? I simply started eating healthier, fruits, veggies, using better cooking methods, not so much frying and breading! I quit snacking all the time, and started walking. I started slow, both in cutting back on my eating and my walking, but as the pounds dropped, I got more enthusiastic, and tried harder. I walked further and ate healthier! How do you keep going when you are lacking motivation and feel yourself falling back into old habits? This is tough. I keep a "before" picture on my fridge and I never forget all the humiliation that went along with being morbidly obese. I also try to remember all that I have gained in my life by losing the weight--I can walk anywhere, and fit in chairs, airline seats, booths in restaurants, I went from taking five prescriptions for high blood pressure to needing no prescription drugs at all! I got my health and freedom back and I refuse to give it up! What is your best advice for others who are trying to lose weight? Just remember: You have the power. You are in control of the choices you make. It feels so good when you make good lifestyle choices. The shame and embarrassment I felt over what I had done to myself is gone. Keeping the weight off is a never-ending battle for me, but I try to stay determined, because going back to that sad, overweight, unhealthy woman I was for so many years is just not an option anymore. My husband is fighting Stage 4 Cancer, which will ultimately be terminal, and that gives me added motivation. I need to stay healthy and strong in order to take care of him, just as he took care of me for our whole married life. How did you lose the weight? I lost the weight by eating clean (whole, real foods) and working out six days a week. All that old fashioned advice - it actually works! What was the hardest part of losing the weight, and how did you overcome that? Living overseas and not having access to modern equipment/classes/gyms (or being able to just go out for a run because of safety concerns) and all the fancy health food; and on top of that, having young children (especially one who wakes multiple times at night) - the hardest part has been keeping my mental focus on the goal (even when very sleep-deprived). To overcome this, I have posted motivational statements and sweet notes from friends around the house and doing my best to bring as much newness and spice to my workouts so that they don't get old. A bonus? Having a husband that keeps me on my toes and lovingly encourages me every day that I can do this! What is your best advice for others who are trying to lose weight? Give grace to yourself. We're not perfect and losing weight won't be perfect. When you make a decision that you're not terribly proud of, give yourself grace and then try to do the next best thing. How did you lose the weight? I realized that the work was going to be hard and it was entirely up to me to get it done. I couldn't rely on a feeling, mood, external motivation or anything consistently besides my own will and determination, so I started running, rethinking my food intake and forced myself to be really honest about everything I ate, thought, and did. What was the most surprising/helpful thing you learned about yourself while losing weight? Even though in 2014 my goal was to lose weight, I actually unintentionally maintained my weight. What I learned, quite by accident, was that maintenance will look nothing like going back to my old habits; maintenance takes just about as much work and focus as losing weight does. 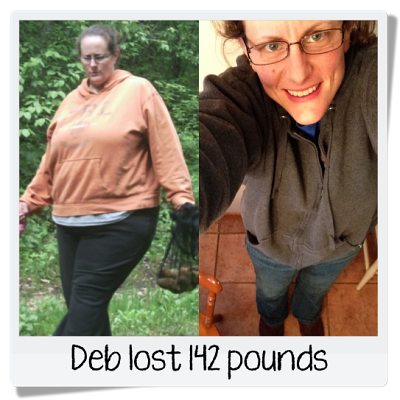 This is truly a lifelong nutrition and exercise shift, and I can't stop the work when I hit my goal. How do you keep going when you are lacking motivation and feel yourself falling back into old habits? My body project was chugging along slowly when a friend suggested that I start reading Runs for Cookies. It was there that I read about the significant trifecta between me, motivation and determination. 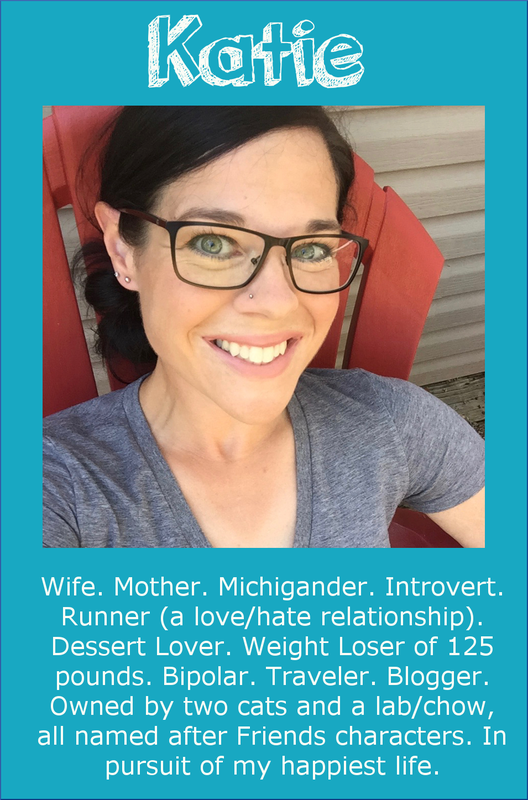 Katie wrote about how my determination allows me to take an active roll in my weight loss, while waiting for motivators (like I had been doing), was taking a more passive route. It was a life-changing moment for me, and from then on I've relied on my determination, primarily, to move forward, and use the pride I know I will feel when I meet my goal as motivation. I have used physical tokens as rewards for when I meet a goal, but I find that they really aren't as motivating as the accomplishment itself in the end. I also keep a website so that I have a public forum from which to share my story. Holding myself accountable publicly is HUGE motivation!!! What is your best advice for others who are trying to lose weight? You have to be really honest with yourself. That may sound easy and you may think that you are in your own head so that's impossible to be anything but honest, but I spent years telling myself that I was just was a certain way and had medical challenges that prevented me from being successful. Those were just lies I told myself to give the excuse to stay unhealthy, because my real truth was that I was crazy lazy when it came to my health in general. What do you wish your “heavier self” had known? With the exception of a brief year at the end of high school, I have always been heavy and didn't know any other way of living life. I wish I had known how much I was limiting myself. My world is so much bigger now. Life isn't intimidating anymore. How did you lose the weight? Ate fairly "clean" and in moderation, as well as a combo of exercise--strength training and cardio. I worked out 4-5 times per week when first starting, but now down to 3-4 times per week. I stuck to lean proteins, lots of veggies, fruits and high-quality carbs. 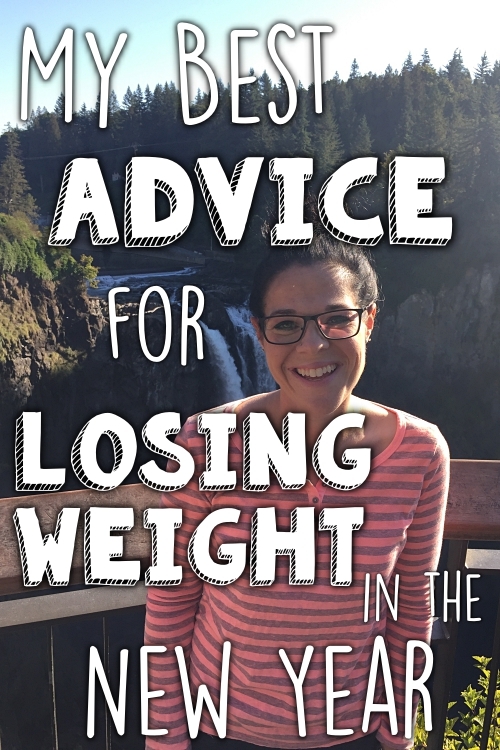 What is your best advice for others who are trying to lose weight? Just start making small changes at first and don't make large goals at the beginning. Start with small goals, and when you hit each one, then you can change them as you go. The more manageable your goals the easier they are to achieve and maintain. Also, you won't become as easily discouraged if you set small, manageable goals. What is your best suggestion for keeping the weight off and not returning to old habits? Put old pictures of yourself up somewhere or on Facebook so you can see how far you have come and what you have achieved. Why would you want to go back to your old self if you were not happy with it? What do you wish your “heavier self” had known? I wish I had really been aware at the "food" I was eating and how bad it really was for me. The "food" that I was eating was not actually food, it was all processed "frankenfoods" that had absolutely no nutritional value. 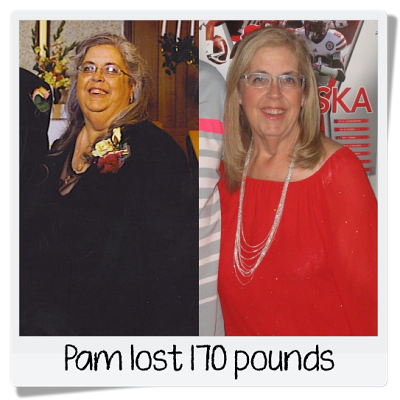 It is NOT easy to lose weight, but it is possible! It takes hard work, motivation, determination, as well as heart to achieve your goals. Take it one step at a time and you can achieve it! 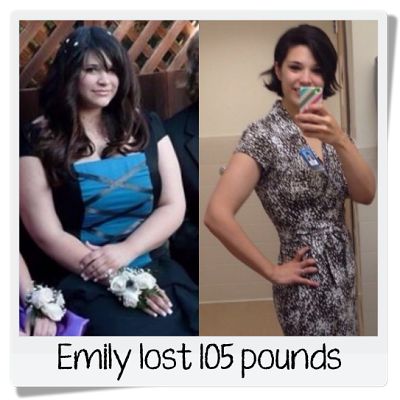 If I could do it, you can too! How inspiring are they?! I am so stunned by all of these amazing people. If they gave you a boost of motivation today, please leave them a comment here and let them know! A huge congrats to everybody on your hard work!! HOT DAMN! This is very inspirational. This is SO awesome. How inspiring. Congrats to all!! What an awesome post! Thanks for all the work you did to put it together for your readers. Inspirational!! Congratulations everyone on your hard work! You all look fantastic and are very inspiring! So. Much. Inspiration. Each and every story is amazing. I applaud each and every one. They have all worked so hard and their hard work paid off. Thanks, Katie, for showing these beautifully inspiring people. And thanks to all of you for sharing your stories. Tremendous. Just Tremendous! So inspiring and exciting to see all these people lose 100+ pounds and keep it off and maintain it! I'm trying to lose 100+ pounds myself, and I can't wait for that day! Thank you for all this inspiration! Incredible success stories. I will read this again and again, so many great tips! 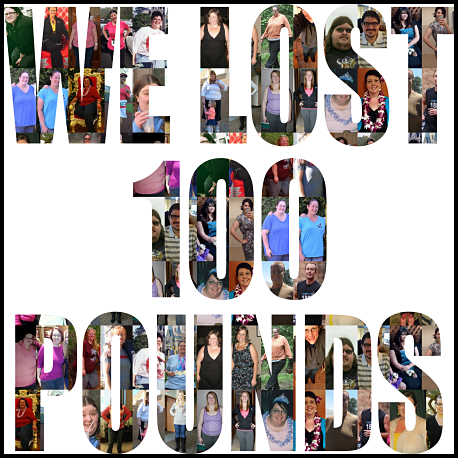 Thanks so much for putting this AWESOME list of 100+ losers together with photos no less!. They are all WINNERS and I loved reading their advice. The "secrets" I kept reading were it takes a lifestyle change with healthy eating habits and consistent activity. I just want to read this every day until I hit 100 lbs lost! Thanks everyone! Brilliant post, everyone. You are astonishing. Thanks for sharing them with us, Katie. Very inspiring!! Happy 100th MM post! wow! congrats to everyone! they all look amazing; this is seriously what i needed to read tonight to jump back into my journey. Fantastic post! These folks are real and awesome. Very inspiring. Thanks for putting this together. Amazing! I loved all the great advice. This has been so inspiring! 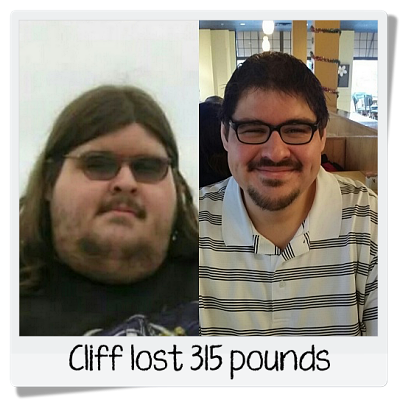 Thanks to all for sharing your stories, I'm currently -32lbs and have about 100lbs to go. It is discouraging at times but reading these stories is such an inspiration! Wow, everyone is so inspiring!! Thanks for sharing your stories. 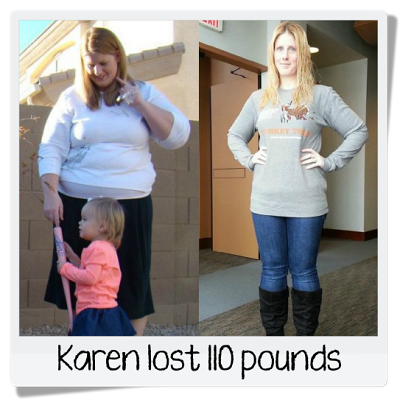 Katie, thanks for such an awesome post and blog. Just starting my 100 lb. journey of 28 pounds lost.....I sooooo needed this today!!! THANK YOU!!! What a great post! Seeing everyones stories and hearing all the advice is inspirational :) Thanks for sharing. Thanks to all who submitted their inspiring story! I'm at the beginning stages of what I hope will be a 100+ loss, working towards regular exercise and a healthy diet. Reading about the changes you've made and the results you've experienced has me all excited for my own journey! -a regular reader from IA. Wonderful post! Thanks to all of the folks who have done amazing things for themselves. You are all an inspiration! Wow, this is so motivational... What incredible achievements these people all have made in their lives! This also gave me great ideas like making a spreadsheet of monthly work outs to keep yourself accountable and on track! Love this post so much! Wow, thanks so much for this post, Katie, and thank you to everyone who contributed. I will be reading these again and again!! This is wonderful! Thanks so much to all who contributed - very inspiring! Keep up the good work! Katie, what a great blog post! Seriously, so amazing! Thank you SOOOO much for the work you put in to putting it together and a big thanks for everyone who shared their pictures, their stories, and their amazingly inspiring words for all of us to read and be encouraged by! You guys are hero's!!! So many wondering and inspirational stories. The strength and courage of everyone (including those who have been apart of pervious 99 motivational Monday's) is awe inspiring. These are awesome! As a 100+ pound loser myself who's kept the weight off for three years (Saturday's my anniversary! ), I can relate to something in each one of these posts--and I even know some of these motivators from SparkPeople! Kudos to everyone for a job very, very well done! This was a great post and so inspiring. Thank you for doing all the work you do to help us and thanks for those who shared their thoughts. The theme seems to be the same in all -- do what you can live with - lifestyle changes, not diets. Amazing! Congratulations to all these very motivating and inspiring "losers." This was a wonderful post that I'm bookmarking to refer to frequently. Katie, thanks for all the time you spent compiling the stories. I'm sure it was a lot of work. And congrats to you on your 100th MM! Thank you Katie for putting this together. Very inspiring! 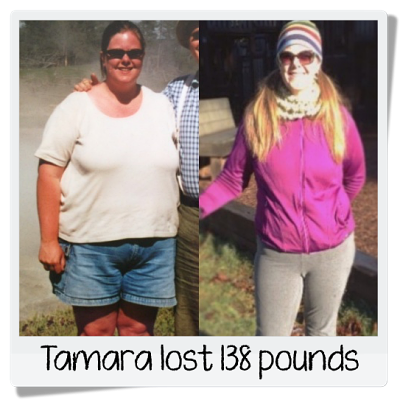 - Tammy B.
Wow! What a lot of motivation in one place! Thank you so much Katie for putting this together -- it's a true milestone for everyone involved and for your blog. This is fabulous! I am halfway there, just hit my 50 pound mark....I am so glad to be staying on point after reading all these wonderful stories! EXTREMELY inspiring. Thanks to everyone for sharing their stories! Congratulations to all! They are all very inspiring. I am attempting to lose just 30 pounds! Thanks for the inspiration. Wow wow wow! Excellent job everyone! Everyone is so motivational! Thanks for this post, Katie. 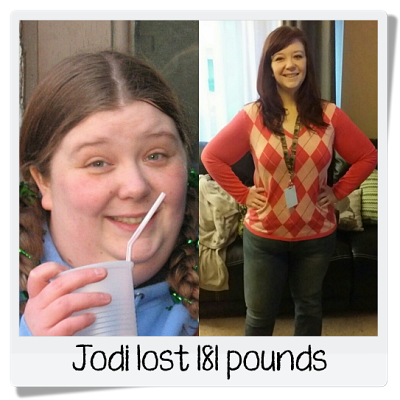 It really helped me to see others who fight some of the same battles I do, yet have lost so much weight and kept it off. Wow, incredibly inspiring! Definitely that little boost I needed today. Great job to all of you, everyone should be so proud!! All of these stories are so inspirational, but I have to say Cliff had some responses that are just right on it for me! I shared them with my husband as well. We are both working very hard to get back in shape and lose some weight. What a great read. Thank you all for sharing your stories! Wow. Just. Wow. Thank you to everyone who shared their fantabulous stories! Katie, thank YOU for taking the time and effort to compile all of these MotiMondays over the years. This post is so inspiring!! I am at 84 pounds lost right now and need to lose around a hundred more. It is so helpful to know that I am not alone and that others have successfully done the same thing! Wow! This post is MAGIC! I have 70lbs to lose (13 down in 6 weeks!). I am going to reread this the next time I have a bad day or am having trouble finding my motivation. I have started and stopped (and regained) with weight loss so many times and I am determind to never stop this time. My healthy changes are for life now and everyone above is so very inspiring. Katie thank you so much for puttting this post together! Wow. You're all amazing. Thank you for sharing these stories! Congrats to everyone in this post. Amazing. I've shared the link around, you are all an inspiration and have such great advice. Way to go, everyone! I doubt I will ever get to 100 lbs lost, but I do hope to reach my goal and keep it off like you guys have. Thanks for being so inspiring! I didn't expect to read every word... but I did! Super inspiring! Amazing. I love reading success stories like these. Thank you, Katie, for putting this together. Wow, so many amazing people! 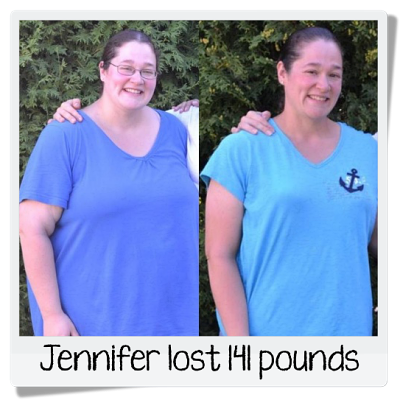 Jennifer's comment about watching her mother die from kidney failure, etc., from being overweight really hit home - my father died a couple years ago at 66 years of age for the same reason. Despite all we tried to encourage him, he never had the determination to do what you all have done and make your lives healthier. Thank you, everyone, for sharing! Very inspiring, gives a bit of perspective to your own journey! This is fantastic! Thanks to everyone for sharing! You all have so much to be proud of and it was good to "hear" advice that I have also thought myself. Thanks so much! I remember you saying you spent something like 8+ hours writing this post. It was SO worth it! What an inspiring, happy post! Congratulations to all of the 100+ club! And thanks for the post, Katie. :-) Very inspiring! Good luck to everyone else on a weight loss journey. Each and every one of you have taught me a little something new. Thank you so much for giving me the motivation to just keep it going. I just can't stop thinking about what great spouses, parents and employees each of you must be. You each show amazing strength, fortitude and grace. Thanks Katie for creating such a great Monday. This post me tear up. Congratulations to you all. You are all inspirational! I loved reading your stories. Wow! What a great group of amazing stories of determination and strength. 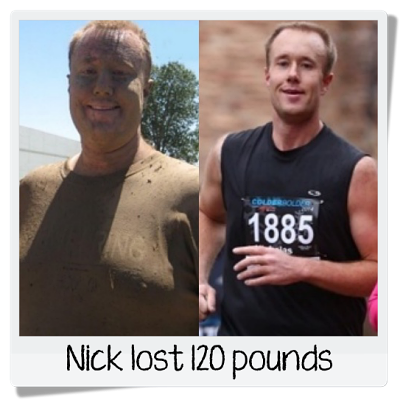 I am in such awe with the challenges these people overcame and how they are maintaining their loss. So amazing and the best motivational monday post ever. Thanks Katie for taking the time to put this together and sharing these great stories. Super work, Katie and all of those in the stories! I meant to comment earlier but I kept getting sidetracked clicking on the links to the blogs! Wonderful! Congratulations to everybody! All of this is great advice. I took something away from EVERY SINGLE PERSON profiled above. This was truly amazing to read! These are amazing stories! I just started running a month ago and (as much as I already love it) some days it feels like I'm never going to see any weight loss. Reading this has made me feel even more motivated to stick with it! Thank you! how come no one ever really talks about the excess skin issue. i know people who feel defeated before they start because they know of other people who have lost over 100 lbs and they still have all of this hanging skin and they still are not happy with the way they look after all the effort. it's very depressing and skin surgery is so expensive for the millions of people with crappy insurance. the skin issue is always left out of these types of conversations like folks just go from being 300 lbs to a size 6 with no issues. i would like to know the real deal on how many of these people had loose skin issues and how they dealt with the cost and really complicated after care of the skin removal surgery. Actually, when asked politely, I would bet that several (if not most or all) of these people would be willing to open up about loose skin (myself included). I've been extremely candid on my blog about my own experience. But I suggest you read my response to people who rudely ask about loose skin, because several others who have lost a large amount of weight have told me they feel the same way. The response is on my FAQ page.